I’m sure by now the little love of your life has had many “firsts” – first word, first step, first play date, and of course, first tooth! The first thing to understand is a lot of dental offices, including ours, are so much more “kid-oriented” than when you were a child. We know for many, dental visits were scary. However, times have changed. Here at Larrondo Family Dentistry, we strive to make the overall experience so much fun that kids don’t know if they just left the dentist’s office or Grandma’s house. They’ll walk out with everything from fruit-flavored toothpaste to cool gadgets and prizes! If you’ve had a bad experience at the dentist as a child, it’s important not to let your child see this. 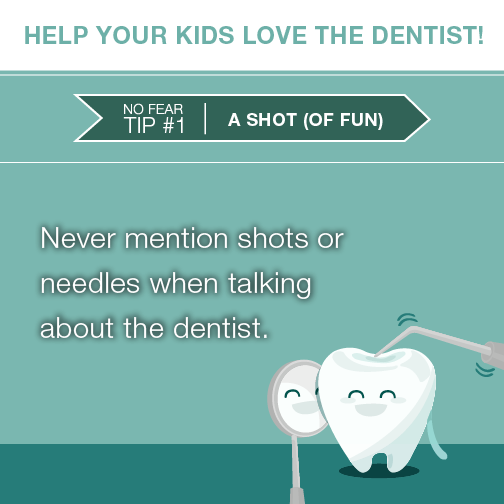 Saying negative things like “I don’t like the dentist either, but we have to do this” will only scare them even more. Remember to keep things positive and to let them decide for themselves if they like their Hemet dentist or not. After they get back from our fun office, we know they will! At this age, your little bundle of joy may not fully understand what is going on (and that’s okay), but getting him or her prepared and ready to fit into our hemet dental home right away will make things easier, especially as he or she gets older. Read children’s books about going to the dentist and answer any questions in a positive way. Play pretend. Pretend you’re the dentist and your child is the patient and you are going to count his or her teeth just like a dentist would. Practice good oral hygiene by making sure your child brushes twice a day. Help your child learn to floss (children should start flossing, with assistance, around age two). While you are assisting with brushing and flossing, explain you want to keep teeth clean for the dentist and keep the “sugar bugs” away. Reassure your little one that everyone has to go to the dentist to have their teeth polished and checked, even Grandma and Grandpa! Tell your child he or she can bring a special friend along (like a stuffed animal) to help be brave. The visit will be short but sweet. Your child may be nervous (there may be some tears) so it’s important for you to remain calm. We’ve got this – we will do everything we can to keep it a positive experience. Dr. Larrondo will complete an exam and check gums, cheeks, and teeth. Dr. Larrondo and the dental team will go over basic oral care and tips on how to keep teeth squeaky clean and healthy. We may or may not actually complete a cleaning. This is a “happy visit” and if your kiddo expresses fear, that’s fine. We will try again next time. Our entire team wants your little one to enjoy the overall experience, laying a good foundation for future visits. We at Larrondo Family Dentistry strive to make sure that you and your child enjoy each and every appointment, but especially the first visit. Call us today at (951)925-6596 for an appointment. We can’t wait to meet your little one! Don’t forget to get the word out! We know your little ball of energy has a few friends who will have their first dental appointment soon too. Be sure to share this blog post with other parents on Facebook, Google+, and Twitter! SUBSCRIBE to our blog posts and FOLLOW US on Facebook @LarrondoFamilyDentistry for more great tips and articles!